Microsoft Inc. has partnered with 29 popular Indian websites such as BookMyShow, ESPNCricinfo, Flipkart, Naukri, Sify, SnapDeal and Zapak Games to promote its new browser Internet Explorer 9 launched earlier this month. Read about IE9 on Techcircle.in. According to Microsoft, the partnership will "light up the online experience" and "show off the capabilities of Internet Explorer 9". It essentially means that the websites have allowed Microsoft to display the new features of IE9 such as the ability to pin their sites into the task bar for easier access. It also means integration of the partner sites with the browser, so users can jump to the particular content that is of most interest. 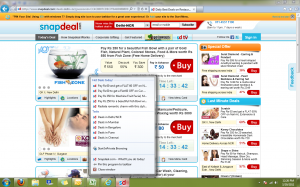 For instance, there is the deal site Snapdeal.com. In the task bar, users can see all the hot deals that are on offer or shift between cities. Globally, Microsoft has partnered with 250 websites like Facebook, Twitter, LinkedIn, CNN, Wall Street Journal and USATODAY. This may be a marketing strategy by Microsoft to gain leverage with online media companies and attract site users. However, IE9 may need to deliver more to keep up with more popular browsers like Firefox 4 by Mozilla and Google's latest version of Chrome which were launched last week. Interestingly, Firefox 4 was downloaded 7.1 million times in the first 24 hours since its release, beating the IE9's record of 2.35 million downloads. Opera, too, has launched new versions of mobile browsers. Read more about Opera Mini 6 and Opera Mobile 11.01 on Techcircle.in.